With the year-end statistics in, the number give us a good idea of uptick in population (including transients) and activity. Last year, the police dealt with 640 calls for service just in town, while responding to 143 out in the county. Total calls came in at 783. 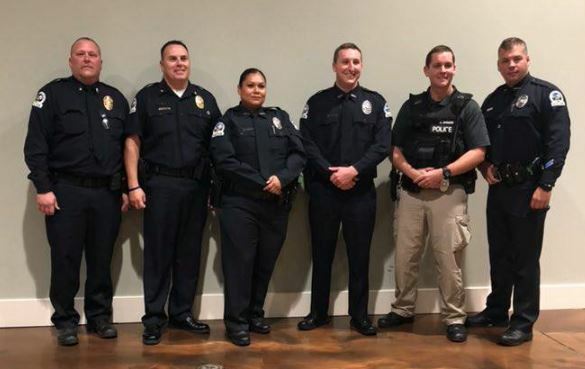 New officers, Juana Diaz and Mike Charlton (center) join CCPD. There were only 3 felony arrests, along with 18 misdemeanor arrests. On the street, they issued 98 summons and 206 parking tickets (along with 140 warnings. They also logged 411 foot patrol hours in town, and 324 in Bay Creek. Building checks came in at 332.